A Basic Mining "Plan of Attack"
I received the following request from Beth Z., an avid reader and supporter of "Bedrock Dreams." Initially I intended to answer Beth via e-mail, but the more I thought about it I realized her request was not only a good one, but also that it had relevance to many of you out there. "I am thoroughly enjoying your site and it makes a great reference for me." "I currently live in 'XYZ' (Note: location withheld to protect Beth's privacy. J.R.) but I am moving back to the 'ZYX' area very soon. I have a question if you would indulge me?" "You speak about doing the research or 'plan of attack' before going off willy nilly and that's sound advice.....but I was wondering if you could expand on just how to research? I will be attempting to not only gold pan but to also nugget shoot in the 'ZYX' area and 50-mile perimeter." "Could you take the time to lay out the bullet points on researching something like that?" "Thank you in advance for helping an old codger like myself." If you've visited or read my other blog, "Treasure Trove Dreams," you already know the importance I place on research. In fact, thorough research is the single most important factor shared by successful treasure hunters and, to a great extent, this is also true of successful prospectors and small-scale or recreational miners. Geological bulletins, papers, and reports (both state and United States Geological Service). Historical mining accounts, including personal narratives (with a focus on where the best gold values were found and recovered, especially if certain areas produced nuggets). Mining production records (ditto to the previous bullet). Current status of claims in the "ZYX" area and whether any public mining access exists (none of this will be of any value if you can't find a place to prospect, pan or mine, right?). Obviously, this list is by no means all inclusive and I'm sure you can come up with other good research "avenues" as well.. I suggest you be creative in your research efforts, evaluate the potential of gold areas you're interested in, and and plan your prospecting, sampling, and mining efforts accordingly. The rule of thumb here is that any time you are planning to mine or nugget shoot a new gold locale, having this sort of knowledge already in hand gives you obvious advantages right from the get go. Additionally, it helps prevent a "stumbling around in the dark" approach where your chances of success are greatly lessened. Once your research has provided you with advanced knowledge of an area you'll be working for the first time, you should back that broader knowledge up with thorough sampling methods and techniques. 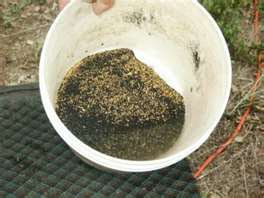 I can't overemphasize the importance of good sampling out in the field and its relationship to overall mining success. Both Beth and I use the term "willy nilly" to describe the tendency of some recreational or small-scale gold miners to rush around poking and prodding Mother Earth here and there with no rhyme or reason in the hope that some color will show up in their pans. This is a key mistake many novice miners make (and a few self-proclaimed placer mining "experts" as well). "NO TWO GOLD AREAS ARE THE SAME." Each area you work will exhibit its own unique characteristics in terms of where the gold is and how it is deposited or distributed in a given stream bed or dry wash. Remember that. OK, so here's a basic mining "plan of attack:"
1. Do your research first (remember, knowledge is power.). 2. Sample, sample, sample (once in those new diggings or nugget patch a systematic approach is your best ally). 3. Determine the best method and gear for getting the gold (once you've found where the gold is, use the right gear for the task at hand and employ it in a manner that'll help you recover the greatest amount of yellow metal). 4. Be persistent and willing to work your rear end off (Even after you've completed the first three steps here, it's going to take hard work and persistence on your part to recover that gold and put it safely in your poke. As I've said many times before, gold mining is not for lazy asses, couch potatoes, or those who can't see a job through to completion). I want to thank Beth for her message and request. I hope this helps her (and you!). If you liked this post, you may want to read: "True Bedrock vs. False Bedrock (Part 1)"
Gary, those skeeters can be problematic! Along the N. Yuba in N. Calif. (my old dredging haunt) they were terrible early in the morn and in the evenings. Sounds like the spot has possibilities though...I'd try doing a bit of research on it. Good luck. J.R.
Good stuff. Thanks for the concise and informative piece, JR! You're most welcome Keith. Thanks for commenting. J.R.